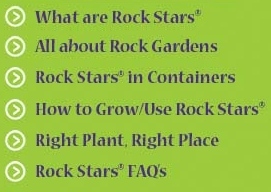 In such places you can either amend a small pocket of soil to improve the drainage, or else just select Rock Stars® that will adapt to the available conditions. See our note on searching, below. 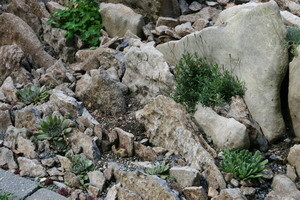 Some of our more adaptable and substantial Rock Stars® plants make ideal tuck-ins or edgings. You can find the very best candidates by using our Advanced Search and clicking the box for Edging Paths listed under Plant Uses and Characteristics as well as some additional boxes to describe the light and soil conditions. Types suitable for edging paths are just as useful along the front edge of a perennial or flower border, so long as they receive suitable light and have good drainage. 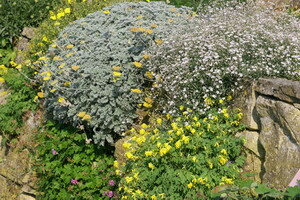 Just make sure your taller and more vigorous border flowers don’t flop over these little gems or cast too much shade. Nip, tuck and accent any wall garden. We have a whole other line of low-growing plants called Jeepers Creepers™ that are also excellent candidates for a edging, accents or tuck-ins. You may well find other candidates to do the job in the perennial department at your local nurseries and garden centers.